Syria pressed its military crackdown against protesters and arrested hundreds of people in a Damascus suburb Monday, spurring exiled Syrian opposition members to take new moves to help steer the antiregime movement. Exiled opposition members are planning to gather regime opponents in Cairo this month, several of these people said Monday. Organizers said the conference, which is being planned with input from opposition and civil-society members inside Syria, will gather people from across the political spectrum, including activists affiliated with the country’s banned Muslim Brotherhood. Syria’s crimes against humanity will be presented to the United Nations next week by Radwan Ziadeh, who announced the Cairo meeting of the Syrian opposition in Cairo. He is teaching at George Washington Univ this year. Here is the Youtube of it by Radwan. DAMASCUS, Syria — The Syrian government has gained the upper hand over a seven-week uprising against the rule of President Bashar al-Assad, a senior official declared Monday, in the clearest sign yet that the leadership believes its crackdown will crush protests that have begun to falter in the face of hundreds of deaths and mass arrests. The remarks by Bouthaina Shaaban, an adviser to Mr. Assad who often serves as an official spokeswoman, suggested that a government accustomed to adapting in the face of crises was prepared to weather international condemnation and sanctions. Her confidence came in stark contrast to appearances just two weeks ago, when the government seemed to stagger before the breadth and resilience of protests in dozens of towns and cities. Ms. Shaaban said nearly 100 soldiers and members of security forces were also killed by armed militants, whom she accused of manipulating “the legitimate demands of the people.” While administration officials in the United States and even some activists have acknowledged that some protesters have resorted to arms, they call them a minority. She added later, “You can’t be very nice to people who are leading an armed rebellion, in a sense,” while acknowledging they were not the only factor in the tumult. In a sign that the government remained uncertain over the nature of the uprising, she declined to specify who was behind them, saying only that officials were still investigating. Administration officials have said that Ms. Shaaban and Vice President Farouk al-Sharaa have seemed more receptive to calls for reform, though their influence appears to pale before more aggressive voices in the ruling elite, particularly Mr. Assad’s brother Maher, who heads the elite Republican Guard and Fourth Division. 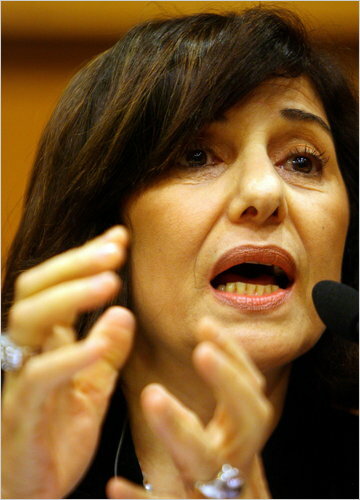 Ms. Shaaban said she had been asked to open talks with dissidents. Last week, she said, she met with Michel Kilo, Aref Dalila, Salim Kheirbek and Louay Hussein, all veteran activists, and held out the prospect of a freer press, political parties and an electoral law. She called it the start of a national dialogue, although some in the opposition have branded it an insincere effort to simply co-opt as many of them as possible. “In the next week or so, we will broaden it,” Ms. Shaaban said. President Assad has long frustrated allies and even foes by promising reforms, then seeming unable or unwilling to carry them out. Despite Ms. Shaaban’s promises, one administration official contended that the government was still fighting for its survival. Even if it wins the upper hand, the official suggested, any change would prove limited. But in contrast to Libya, where the United States insists that Col. Muammar el-Qaddafi step down, American officials have simply repeated calls for Mr. Assad to meet popular demands, and Ms. Shaaban’s outreach seemed aimed at addressing some calls for change. But even if the government fails to placate the opposition, she suggested that international condemnation had so far been muted. She described the statements from President Obama and Secretary of State Hillary Rodham Clinton as “not too bad” and said that the sanctions themselves — imposed by the United States last month and the European Union this week — were manageable. The Syrian Government plans to finance its expenses by increasing its deficit and to review free trade agreements signed with partner countries, according to the Syrian President, who gave the first hints of what Syria’s future economic policy will be during a meeting with business representatives. In a talk with a business delegation from Damascus on Tuesday 3 May, Mr Al-Assad reportedly said that “during the coming period we will protect the local industry and review trade agreements that have helped dumping practices” from other countries. The Syrian President’s words were published by Al-Watan, a local daily. Syria’s trade liberalisation policies have seen it sign two major free trade area agreements in the last decade: one involving almost all member states of the Arab League, under the Greater Arab Free Trade Area (GAFTA), which entered fully in force in 2005, and the other with Turkey, starting 2007. Both involved the scrapping of almost all customs tariffs barriers, although in the case of Turkey, customs tariffs continue to be applied on Turkish imports albeit on a gradually declining scale until they are fully lifted in 2019. An association agreement to be signed with the European Union and that encompasses a bilateral free trade area has also been initialled although it has not yet been signed. The liberalization of the country’s foreign trade has often been decried by manufacturers and analysts for having been conducted too swiftly and with little regards for the interests of local producers…..
Syria’s economy should shrink by as much as 3 percent this year, while the budget and current account deficits will further deteriorate this year and next, according to one of the first assessments of the impact on the economy of the current unrest gripping Syria and the Middle East. These new forecasts were published last week in a paper by the International Institute of Finance. The paper attempted to assess the short-term economic impact of the unrest around the region under the title “The Arab World in Transition: Assessing the Economic Impact.” The IIF is a global association of banks and financial institutions. Among all Arab countries surveyed in the report – 17 in total – Syria is one of only 4 projected to see a decline in economic activity this year –the others being Yemen, Egypt and Tunisia. Only Yemen, with a contraction of 4.5 percent, will witness a steeper decline. In 2012, the Syrian economy is expected to grow again, although by only 2 percent, the lowest rate across the region. Syria’s current account is also projected to decline this year to 5.4 percent of GDP from 4.5 percent last year, on the back of “a sharp drop in earnings from tourism.” The current account deficit as a percentage of GDP will, however, be smaller than in Jordan, Lebanon or Tunisia. Meanwhile, inflation is expected to jump to 8 percent in 2011, while the budget deficit should rise to 5 percent of GDP from an estimated 3.1 percent last year. ذكر التلفزيون السوري أن مفتي درعا الشيخ رزق عبد الرحيم أبا زيد عاد عن استقالته التي قدمها في وقت سابق دون ذكر تفاصيل. A New Committee to Fight Corruption has been appointed with twelve member named below. Egypt is running out of food, and, more gradually, running out of money with which to buy it. The most populous country in the Arab world shows all the symptoms of national bankruptcy – the kind that produced hyperinflation in several Latin American countries during the 1970s and 1980s – with a deadly difference: Egypt imports half its wheat, and the collapse of its external credit means starvation. The civil violence we have seen over the past few days foreshadows far worse to come. The Arab uprisings began against a background of food insecurity, as rising demand from Asia priced the Arab poor out of the grain market (Food and failed Arab states, Asia Times Online February 2, 2011). The chaotic political response, though, threatens to disrupt food supplies in the relative near term. Street violence will become the norm rather than the exception in Egyptian politics. All the discussion about Egypt’s future political model and its prospective relations with Israel will be overshadowed by the country’s inability to feed itself. Egypt’s political problems – violence against Coptic Christians, the resurgence of Islamism, and saber-rattling at Israel, for example – are not symptoms of economic failure. They have a life of their own. But even Islamists have to eat, and whatever political scenarios that the radical wing of Egyptian politic might envision will be aborted by hunger. The Ministry of Solidarity and Social Justice is already forming “revolutionary committees” to mete out street justice to bakeries, propane dealers and street vendors who “charge more than the price prescribed by law”, the Federation of Egyptian Radio and Television reported on May 3. According to the ministry, “Thugs are in control of bread and butane prices” and “people’s committees” are required to stop them. Posters on Egyptian news sites report sharp increases in bread prices, far in excess of the 11.5% inflation reported for April by the country’s central bank. And increases in the price of bottled propane have made the cost of the most widely used cooking fuel prohibitive. The collapse of Egypt’s credit standing, meanwhile, has shut down trade financing for food imports, according to the chairman of the country’s Food Industry Holding Company, Dr Ahmed al-Rakaibi, chairman of the Holding Company for Food Industries. Rakaibi warned of “an acute shortage in the production of food commodities manufactured locally, as well as a decline in imports of many goods, especially poultry, meats and oils”. According to the country’s statistics agency, only a month’s supply of rice is on hand, and four months’ supply of wheat. The country’s foreign exchange reserves have fallen by US$13 billion, or roughly a third during the first three months of the year, Reuters reported on May 5. The country lost $6 billion of official and $7 billion of unofficial reserves, and had only $24.5 billion on hand at the end of April. Capital flight probably explains most of the rapid decline. Egypt’s currency has declined by only about 6% since January, despite substantial capital flight, due to market intervention by the central bank, but the rapid drawdown of reserves is unsustainable. At this rate Egypt will be broke by September. Egypt imported $55 billion worth of goods in 2009, but exported only $29 billion of goods. With the jump in food and energy prices, the same volume of imports would cost considerably more. Egypt closed the 2009 trade gap with about $15 billion in tourist revenues, and about $8 billion of remittances from Egyptian workers abroad. But tourism today is running at a fraction of last year’s levels, and remittances are down by around half due to expulsion of Egyptian workers from Libya. Even without capital flight, Egypt is short perhaps $25 billion a year. …. According to the daily al-Ahram, hoarding of rice by wholesalers has pushed up the price of the grain by 35% this year, while 200 containers per day are sold to Turkey and Syria. “What is happening,” the newspaper claims, is that that traders are storing basic items such as rice and barley, hoarded in barns and in large quantities, and are reluctant to send it to the rice mills in order to raise the price of this strategic commodity”. The al-Ahram report, headlined, “Conspiracy to Monopolize Rice,” demands physical inspection of containers leaving Egyptian ports. The rest of the story is predictable. Once the government relies on young men with guns to police its merchants, hoarding will only get worse. The Egyptian revolution has cracked down on the commercial elite that ran the country’s economy for the past 60 years, and the elite will find ways to transfer as much of its wealth to safety as it can. The normal chain of distribution will break down and “revolutionary committees” will take control of increasingly scarce supplies. Farmers won’t get fuel and fertilizer, and domestic supplies will fail. The Egyptian government will go to the International Monetary Fund and other aid agencies for loans – the government reportedly will ask for $7 billion to tide things over – and foreign money at best will buy a few months’ respite. The currency will collapse; the government will print IOUs to tide things over; and the Egyptian street will reject the IOUs as the country reverts to barter. Asma al-Assad is not in London. This Story is not true according to good sources. Words Behind Bars–Syrian Poet Faraj Bairqadar Speaks after 14 Years of Detention, by Mohammed Ali Atassi. We all know beyond a doubt that reforms are needed in Syria in all sectors. We know things could and should be better, but not by using the force of violence and destruction. When the safety, security and future of Syria in the balance, I stop my demands and greed until it is safe. This is real love and commitment. Some of the comments out there about Syria and the president are so distasteful, scary and viscous, make you want to disappear from earth. So yes I chose Syria over empty logos with little meaning at the moment. History will be made if Syria can be saved from this circle of violence and if the ambitions of the US, friends and allies are crushed in the Middle East for the first time. the future will tell. God bless Syria. God bless Syrians. At least 48 people have been killed in Syria by the security forces in the last four days, local and international human rights activists have told Amnesty International, as the crackdown on the coastal city of Banias intensified. More than 350 people – including 48 women and a 10-year-old child – are also said to have been arrested in the Banias area over the past three days with scores being detained at a local football pitch. Among those rounded up were at least three doctors and 11 injured people taken from a hospital. …Amnesty International has compiled the names of 28 people who were apparently shot dead by security forces on Friday and those of 12 others killed over the last three days. The organization now has the names of 580 protesters and others killed since mid-March, when protests against the government of President Bashar al-Assad began. The 28 people killed on Friday include at least nine in Homs, six in Hama, four in Latakia, four in Dayr al-Zor, three in Dera’a, one in Idleb and one in Damascus…..
Tanks have also entered Syria’s third-largest city, Homs, and the Mu’dhamiyeh suburb of Damascus, as well as Tafas. Today in Dera’a, Waleed Hamed Ta’m Allah Abazeid was reported to have been shot dead. The Syrian government continues to attribute killings to “terrorist armed gangs” conspiring against it. The Syrian State News Agency, SANA, said that yesterday a minibus carrying civilians was ambushed near Homs by an “armed terrorist gang”, resulting in the deaths of 10 workers. One Syrian human rights activist told Amnesty International, however, that the minibus had been shot at by security forces manning a checkpoint. Amnesty International has not been allowed access to the country and can not verify the conflicting reports. …. From my understanding (aided much by reviewing articles and comments on Syria Comment from the past couple of years), the Syrian President does not speak to the Syrian people directly. I still find this extremely puzzling. In a time of national crisis, it seems as if he is behind the scenes. His meetings are reported by ‘sources’ and the semi-official press, but in the end he does not address the people. He speaks to the Syrian Assembly, and he speaks to the new Cabinet — both speeches nationally televised — but he does not speak otherwise. Is this as I surmise — a long-standing habit? Does anyone from Syria or otherwise knowledgeable about Syria expect him to break with this habit and appear in a nation-wide address at any time in the near future? It seems uncanny. On another topic, I see that the Syrian minister and presidential media advisor speaks to the New York Times, but of this interview nothing at all appears in the semi-official press. If she is a cabinet-level member, and accepts the visit of an American reporter for his brief visit to Damascus, does she also accept the visits of other well-known reporters from Syrian media? We have discovered that our Arab people, from the Atlantic to the Gulf, feel the same pain and have the same destiny and aspiration. They long to strengthen the ties of freedom among their members after long division and fragmentation. If their enemies have described them for the past decades as terrorists, fanatics, extremists and of being submissive, these revolutions have shown the whole world the energy and the love of freedom Arabs have and their willingness to die for it, in their fight against tyrants, local and foreign alike. Now, am I wrong to think that there is a ‘reality-gap’ between what she writes in her essay and what she says to the New York Times — or am I hopelessly naive? I assume that she and the President are sophisticated people who want their views known. But why do they not speak to the Syrian Nation? What are they waiting for? Two other questions — is it legal/acceptable in Syria for anyone to quote the minister’s words from the Times? If she wants to initiate a dialogue . . . then will her call for dialogue appear in Syrian media? “We want to use what happened to Syria as an opportunity,” said regime spokesperson Bouthaina Shaaban. “We see it as an opportunity to try to move forward on many levels, especially the political level.” That language is bogus because what happened does not create any opportunity that wasn’t available beforehand. Rather, what happened is a wake-up call to a slumbering regime. But what happened also conclusively demonstrates that the regime is actually popular on the whole, which is a major achievement, and which you have to give them credit for. Congratulations to the Regime, their followers and the tribe that live from corruption, favours and clientelism. You are destroying the country and its economics and its people. How long will it take until you accept that there may be someone in a 20 million population that have better education and skills, can manage the country and have better ideas than you. The only way to let syrian show their habilities is by free elections and of course suspending the terror system of secret services. That´s enough, the system is collapsing. Every day of delay in taking this decision may represent one month or one year lost in recovery. This has been a tradition, inherited from his father, as was his presidency. In over 30 years, his father, to my knowledge, addressed the public only once on TV. He was in military uniform. It was to communicate the status quo at the war front, in the 1973 war with Israel. Apparently, the time was not convenient for him to step outside and go to the parliament. Why not? I do not really know for a fact. I am not sure anyone in Syria dares or cares to question that. My own reasoning is the following: In presidential democracies, the president addresses the public because he is elected, and thus appointed by the public. In Syria, the president is nominated by the Baath party and then approved by public referendum by answering yes or No. Such process is perfunctory, and the result has been invariably 95% to 99% Yes. His appointment, is then confirmed by the parliament. Therefore, both Jr. and his father had only addressed these two bodies. The Syrian government offers two versions of any story. The one for local consumption is usually authoritarian, nationalistic and considers every bit of unapproved foreign gestures or information as conspiracies. The other is cooked for the free world. It complies with their sensitivities to human rights and economical interests and plays the game of protecting the west from Islamic extremism, like Mubarak, Ben Ali, Saleh, and as of late even Qidafi did. Mind you, probably less that 1% of the Syrian public can understand audio-media in non-Arabic language. B Sahaaban statement is a form of manipulation. She is trying to imply that the regime understand the people’s aspirations and that they are working on it. She is saying: Just give us more time to introduce the reforms that the people want. Actually they need the time to finish the uprising. An example of the reforms they recently introduced was the annulment of the emergency laws, and the introduction of the demonstration laws instead. Actually they just changed the name. People still do not have the right to due process! Happy Birthday, Israel! Many happy returns! this blog has become a tribune for defending Israel ? with professional and payed “commentors” contributing regularly with the same goal ? Rizk Abuzeid, the previous Mufti of Daara has stated on Syria tv that he has withdrawn his resignation. He stated that he was pressured to resign and was threatened, by the anti-regime gangs with his life should he not comply with their orders to resign immediately. This only spells out more misery for the Syrian population and the end of the support for Assad of the merchants in Damascus and Aleppo as well as the Turkish review of bilatteral relations with Syria at some point in the future. If you increase your deficit, you are essentially destroying wealth in the long term. While in theory, the government owes the Central Bank bank this deficit. A deficit means you owe someone money because you’re spending more than you’re earning; in this case, because Syria has ‘little to no foreign debt’ the money is owed to the Central Bank (if T-Bonds are issued then its to investors). Because taxes are quite difficult to collect due to poor infrastructure and corruption at the governate and ministerial levels, financing ‘government expenses’ means printing more Syrian currency. Printing more currency devalues your currency and purchasing power and creates inflation. With this comes wealth destruction in the form of higher costs and lowers the ability of the Syrian consumer to consume. Because Syria subsidies a whole array of staples, this eventually means the Syrian government will default in either their payments to the Central Bank (and find it extremely difficult to procure staples not available in Syria), declare bankruptcy, or move towards international loans from the WB or IMF or print more money which inturn creates hyperinflation. Loans from the WB and/or IMF come with conditions, that the Syrian government clearly as we have seen recently, will not push, despite saying otherwise. Increasing your deficit even if you don’t print money, still devalues your currency, but in this case the Syrian government has a double wammy in which its increasing its deficit and printing more money. Hence wealth destruction and either the systemic collapse of Syrian society where the rich and poor are devaseted with this destruction or the widening gap between the rich and the poor in Syria. This widening gap only breeds resentment and resentment breeds hostility which in turn breeds revolutionary action. The problem with the local industry is that it isn’t competitive. And by protecting local industry, essentialy you’re raising import taxes (which has negative adverse implications on bilateral realtionships) and reducing your import tarrifs that ideally should go into the state treasury to help fund local infrastructure projects. As stated in the Syria Report article, Syria has several FTAs, one with GAFTA and the other with Turkey on a staged decrease in tarrif system. If Syria should review and alter any of its FTAs this should have negative reprecussions in its bilateral relationships and would create hostility towards the Syrian regime from once friendly governments. There is no indication that Syria will review its trade relations with Iran for the sake of protecting its local industry which means Iran should benefit greatly from a competitive free market in Syria. Therefore increasing Iranian influence over Syrian foreign policy through its oil exports to Syria and Syria’s dependence on the Iranian market. Because as we know, the only oil industry Syria has is the olive oil indsutry. Either way, the Syrian situation, politically or economically, is dire. The Syrian president does not have the admirable position of sorting this mess that he has inherited from his father and his Baathist system which should indicate to western observers why the Sunni merchants of Damascus and Aleppo have stayed out of politics and instead branched out to other regions to do business, specifically the Gulf, Lebanon, Africa, Europe and North America. It is yet to be seen though, if those merchants still believe Syria is worth fighting for or if they are just content in their businesses that were established when the Baathists came to power outside the country. An article by Michel Chossudovsky on the current events in Syria. Michel Chossudovsky is an award-winning author, Professor of Economics (Emeritus) at the University of Ottawa, Director of the Centre for Research on Globalization (CRG) and Editor of globalresearch.ca. He is the author of The Globalization of Poverty and The New World Order (2003) and America’s “War on Terrorism” (2005). He spent a month in Syria in early 2011. “It is in the interest of the US-NATO alliance to portray the events in Syria as a peaceful protest movement which is being brutally repressed by a “dictatorial regime”. On April 27 Russia and China evidently prevented the U.S. and its NATO allies from pushing through an equivalent of Resolution 1973 against Syria in the Security Council, with Russian deputy ambassador to the UN Alexander Pankin stating that the current situation in Syria “does not present a threat to international peace and security.” Syria is Russia’s last true partner in the Mediterranean and the Arab world and hosts one of only two Russian overseas naval bases, that at Tartus. (The other being in Ukraine’s Crimea. )” (Rick Rozoff, Libyan Scenario For Syria: Towards A US-NATO “Humanitarian Intervention” directed against Syria? Global Research, April 30, 2011) The ultimate purpose is to trigger sectarian violence and political chaos within Syria by covertly supporting Islamic terrorist organizations. I wonder when was the last time Queen Elisabeth II has addressed the people of Canada? They paid a dire price in recent wars just because their country is part of Commonwealth, which has to aline with UK politics even when a majority of people take to the streets (in both Canada and the UK) to refuse their participation to a military intervention such as Iraq. Someone had posted this link on this website but it is getting even more relevant. What is said about Saudi society (the “5,000 princes country”) and the aspiration of Saudi students in the US could very well be applied to Syria. Neither Ms. Shabaan nor the Mufti of Deraa are at liberty to do or say anything that is not sanctioned by the regime. Ms. Shabaan presented the position of Syria as a resistance hub to the hegemony of Israel and at the same time an image to the outside world of a modern secular progressive country. The reality on the ground is that Syria is a weak country that has skillfully used alliances and agreements and at times confrontations to give itself room to move but unfortunately the aim has been in the end to preserve a Mafia style regime that is corrupt and brutal. Ms. Shabaab is addressing the West in the NYT and she is talking the talk of reforms. The president is also as far as he is saying committed to reforms. In reality no one is committed to reforms in this regime. The speech to the parliament was actually so disappointing that it led to more people protesting initially. It is possible that it was used to incite people to protest more and then to crack down on them with a whole set of security measures. The abolition of the state of emergency was a sham. 1. The crackdown had to go from city to city and in this the use of loyal regime elements was essential, yet if the whole country needs to be locked down there will be fissures and cracks and the economy will suffer. 3. Reforms are inevitable, if they are cosmetic we are back to square one and if they are not it means the end of the one party rule and the current structure of the regime. 4. Feeding and clothing and housing and educating the people will not go away, and if the regime ignores this it will have another round of protests sooner rather than later. 5. The use of illegitimate force will entice others to use force the next time around and then the risk of civil war will become very real. 6. It is impossible for 10% of the population to control every aspect of life for ever, there will be change and when it will come there will be retribution at that time. Now I am hoping for some real discussion on this blog and not for people asking for calm so that we can sit and discuss reforms for the next 10 years after all Syria has known parliamentary systems and the rule of law in the past. EU Blacklist of the 13 Syrian officials looks awfully sectarian! وتشمل العقوبات حظرا على الأسلحة ومنع 13 مسؤولاً على رأسهم ماهر الأسد شقيق الرئيس السوري من دخول دول الاتحاد وتجميد أصولهم. وبموجب القرار -الذي نشر في الجريدة الرسمية للاتحاد الأوروبي- يحظر على الدول الأعضاء في الاتحاد أن تبيع سوريا أسلحة أو أن تزودها بها وتصدرها لها، بالإضافة إلى المواد التي يمكن أن تستخدم في القمع الداخلي. وشملت العقوبات 13 شخصية سورية، رأى الاتحاد أنها على صلة بالعنف ضد المتظاهرين، ومن هذه الشخصيات ماهر الأسد -قائد اللواء المدرع الرابع- الذي اعتبره الاتحاد المشرف الأول على العنف ضد المتظاهرين. كما شملت العقوبات أيضاً مدير الاستخبارات السورية علي مملوك، ووزير الداخلية محمد إبراهيم الشعار، والرئيس السابق للأمن السياسي في درعا عاطف نجيب، ورئيس قسم دمشق بالفرع الداخلي لأمن الدولة حافظ مخلوف، ورئيس الأمن السياسي محمد ديب زيتون. كما تشمل العقوبات أيضاً رئيس الأمن السياسي في بانياس أمجد العباس ورجل الأعمال رامي مخلوف، ابن خالة الرئيس بشار الأسد، ورئيس الاستخبارات العسكرية عبد الفتاح قدسية، ورئيس الاستخبارات في سلاح الجو جميل حسن، ورئيس استخبارات ريف دمشق رستم غزالة. كما شملت قريبَي الرئيس السوري فواز ومنذر الأسد لارتباطهما بما وصفه الاتحاد الأوروبي بمليشيا الشبيحة، التي يتهمها المحتجون بمهاجمتهم. وأفادت تقارير بأن مسؤولين أوروبيين رفيعي المستوى سيلتقون في وقت لاحق اليوم لمناقشة احتمال إضافة اسم الرئيس بشار الأسد إلى اللائحة في حال استمرار أعمال العنف ضد المتظاهرين. LONDON, May 10 (Reuters) – Tanks are pushing into Syrian towns. Snipers are on rooftops, shooting at anything that moves. Security forces are mowing down or rounding up protesters. The presence of heavy armour is familiar to the Arab world. It could easily have been that of U.S. tanks sweeping into Baghdad in 2003 or Israeli tanks storming south Lebanon in 2006. But the tanks are Syrian and the targets are Syrian protesters demanding the downfall of Bashar al-Assad’s rule. Assad, 45, who promised reform when he succeeded his father in 2000 after four decades of rule by the minority Alawite sect, has opted for tanks and bullets rather than change and real concessions to address protesters’ grievances. Across Syria, from Deraa in the south to Banias in the north, the grip of repression is tightening and the towns at the centre of the uprising are increasingly becoming isolated. It is getting harder for protesters and activists, inspired by revolts that toppled leaders in Tunisia and Egypt, to move. Many have been detained or silenced. The army and security forces have sealed off the main cities with tanks, erected roadblocks, denying access and cutting some towns off from the rest of the country by severing Internet and phone links. Residents who are occasionally reached by phone or through Facebook and Twitter say they hear about unrest in other cities from Arab satellite television stations and word of mouth. “The regime is closing ranks and trying to crush the opposition,” said Patrick Seale, biographer of Bashar’s father, Hafez al-Assad. “I see the regime getting more and more unpopular using very vicious methods but surviving for the time being,” Seale said. With the authorities using the military against unarmed protesters and with no prospect of the sort of outside intervention to try to stop Muammar Gaddafi’s assault on his people in Libya, the expectation is that Assad will retain the upper hand for now — unless Sunni officers rebel against him. But the price of remaining in power is going up daily. “As long as the army and security forces remain loyal to Bashar, he will survive, but with a damaged reputation,” Seale said. Nadim Houry, Human Rights Watch director in Beirut, added: “Regardless of whether the army and security forces crush the protests, clearly something has been fundamentally broken in Syria between the regime and a large chunk of the population. “That’s not something that can be fixed by repression. The regime is fooling itself into thinking that tanks can resolve the issue. They may quash the protests but they can’t succeed in fixing the underlying issues.” With international media banned from Syria, residents reached on the phone and amateur video recorded by activists are the only testimony to the crackdown against civilians who decided they too had to taste the freedom of the “Arab Spring”. Watching Syrian television or listening to the official media, it is hard to believe there is anything seriously amiss in Syria, beyond random attacks on security and military officials the government blames on unidentified armed gangs, foreign agents, and Islamist militants. There is no evident connection between the narrative of the authorities and the brutal experience of those who have risen in protest. Syrian rights groups said up to 800 people were killed since the protests erupted in March and thousands were arrested. Since then, Assad has not directly addressed the nation. He appeared on television speaking to parliament and the cabinet. “Some people think he has been supplanted, that he has lost authority to the hardliners in the family,” said Seale. In their response, Western capitals still wonder who calls the shots in Syria. Is it Bashar, or is it his younger brother Maher, who commands Syria’s Republican Guard and the elite Fourth Division of mainly Alawite soldiers, or is it his brother-in-law, Assef Shawkat, the former chief of military intelligence now deputy chief-of-staff of the army? In framing sanctions that target members of his family but conspicuously fail to name Bashar, Western policy-makers appear to still nurture the idea that the Syrian president is a potential reformer held back by hardliners in his entourage. Yet, as experts point out, the key issue is not whether Bashar defeats his own people but whether a military solution is sustainable without genuine reforms to remove the spark that ignited the protests in the first place. They argue that citizens, like in other Arab capitals, are rebelling not just against a lack of freedom and opportunity. They are also enraged by corruption that has enriched the elite while one-third of Syrians live below the poverty line. While billionaires cluster around the ruling family, national income inside a still very closed economy has stagnated for decades. “The genie is out of the bottle. They cannot build reforms on a foundation of repression. The more violence they use the narrower the chance for reforms to be accepted,” said Houry. Nor, Syria observers say, can Assad hope to get away with the ruthlessness of his father, who used tanks and artillery to quash an Islamist uprising in Hama in 1982, razing swathes of the city at a cost of between 20,000 and 30,000 deaths. “If anyone thinks they can get away with another Hama they are short-sighted. Information in the age of WikiLeaks, social media and cellphones will flow out,” said Houry. Others think that because of Syria’s pivotal position in the Middle East — as an ally of Iran and Hezbollah yet a country that has dealt pragmatically with Israel — both the region and the world will continue to do business with Assad. But despite the human cost Syrians have paid to protest against years of repression, economic hardship and corruption at the top, few students of Syria believe the minority Alawites, who have ruled the country of 20 million with a 75 per cent Sunni Muslim majority, will enact long-promised reforms. They said any meaningful reform — free elections, the rule of law and accountability — would unseat the Assad clan. “This is a minority regime. If they introduce real political reforms like proper elections, then of course they risk being out of power. They fear they will be massacred. The cloud of Hama still hangs over them,” Seale said. Some give him credit for trying to liberalise the economy and modernise Syria but an explosion in the population, now growing at 2.4 percent a year, over the past three decades far outstripped the capacity of the economy to create jobs. Nevertheless, many Syrians and neighbours alike say any wish for Assad to leave is tempered by a bigger fear — that Syria, with its mosaic of Alawites, Sunnis, Christians, Kurds, Druzes and other groups, could implode into sectarian savagery similar to the conflict that ripped through Iraq after Saddam’s ousting. Many Syrians say they would rather hang on to Assad than risk the aftermath of his departure. But aside from the minority sects, relatives and associates of the Assad family, a new crony capitalist class and other beneficiaries from the secret police to the Shabbiha Alawite militia, those who want change are certainly more numerous. “Syria is in a turning point, it cannot go backward,” said activist Ali al-Atassi. Erdogan speaks out again: He compares what happened in Hama and Homs in 1982 to halbja. In the past we lived through Halabja, Hama, and Homs; We do not want that to be repeated. In the current events, more than 1000 have been Killed so far. (New York Times) — DAMASCUS, Syria — Syria’s ruling elite, a tight-knit circle at the nexus of absolute power, loyalty to family and a visceral instinct for survival, will fight to the end in a struggle that could cast the Middle East into turmoil and even war, warned Syria’s most powerful businessman, a confidant and cousin of President Bashar al-Assad. The frank comments by Rami Makhlouf, a tycoon who has emerged in the two-month uprising as a lighting rod for anger at the privilege that power brings, offered an exceedingly rare insight into the thinking of an opaque government. Beset by the greatest threat to its four decades of rule, the ruling family, he suggested, has conflated its survival with the existence of the minority sect that views the protests not as legitimate demands for change but rather as the seeds of civil war. Asked if it was a warning or a threat, Mr. Makhlouf demurred. Though the uprising has yet to spread to Syria’s two largest cities — Damascus, the capital, seemingly tranquil, was bereft of any military buildup this week, and Aleppo, a key conservative bastion, has been relatively quiet — the protests have unfurled across much of the rest of the country, building on longstanding neglect of the countryside and anger at corrupt and unaccountable security forces. While the government offered tentative concessions early on, it has since carried out a ferocious crackdown, killing hundreds, arresting thousands and besieging four cities. “The decision of the government now is that they decided to fight,” Mr. Makhlouf said. But even if it prevails, the uprising has demonstrated the weakness of a dictatorial government that once sought to draw legitimacy from a notion of Arab nationalism, a sprawling public sector that created the semblance of a middle class and services that delivered electricity to the smallest towns. The government of Mr. Assad, though, is far different than that of his father, who seized power in 1970. A beleaguered state, shorn of ideology, can no longer deliver essential services or basic livelihood. Mr.
Makhlouf’s warnings of instability and sectarian strife like Iraq’s have emerged as the government’s rallying cry, as it deals with a degree of dissent that its officials admit caught them by surprise. Mr. Makhlouf, a childhood friend and first cousin of Mr.
“We believe there is no continuity without unity,” he said. He echoed an Arabic proverb, which translated loosely, means that it won’t go down alone. Mr. Makhlouf, just 41 and leery of the limelight, stands as both a strength and liability of Mr. Assad’s rule, and in the interview he was a study in contrasts — a feared and reviled businessmen who went to lengths to be hospitable and mild-mannered. To the government’s detractors, his unpopularity rivals perhaps only that of Mr. Assad’s brother, Maher, who commands the Republican Guard and the elite Fourth Division that has played a crucial role in the crackdown. Mr. Makhlouf’s name was chanted in protests and offices of his company, Syriatel, the country’s largest mobile phone company, were burned in Dara’a, the poor town near the Jordanian border where the uprising began in mid-March. The American government, which imposed sanctions on him in 2008, has accused him of manipulating the judicial system and using Syrian intelligence to intimidate rivals. Asked why he believed he was sanctioned, he replied, “Because the president is my cousin, or I’m the cousin of the president. Full stop.” He suggested that anger at him arose from jealousy and long-standing suspicions that he serves as the family’s banker. More than just an icon of outrage, Mr. Makhlouf represents broader changes afoot in the country. His very wealth points to the shifting constellation of power in Syria, as the old alliance of Sunni Muslim merchants and officers from Mr. Makhlouf’s Alawite clan gives way to descendants of those officers benefiting from lucrative deals made possible by reforms that have dismantled the public sector. He serves as an instrument, too, in Mr. Assad’s vision of economic modernization, where Syria serves as a crossroads of regional trade and a hub for oil and gas pipelines that link Iraq and the Persian Gulf to the Mediterranean and Europe. Cham Holdings, a vast conglomerate with a portfolio of $2 billion, in which Mr. Makhlouf owns outright a quarter of the shares, is at the forefront of that faltering scheme. Turkey’s recent anger at Syria’s crackdown has fed feelings of betrayal in the government because Turkey was viewed as a centerpiece in that vision. Concerns are growing, too, over the uprising’s economic impact, deepened by Syria’s growing isolation and flight of capital — a legacy that may very well prove more threatening to the government than the protests. Mr. Makhlouf suggested economic reform would stay primary. He warned the alternative — led by what he described as Salafists, the government’s name for militant Islamists — would mean war at home and perhaps abroad. At least Rami is not trying to sell false reforms. He makes it clear that it is either the Assads or chaos. If all you can muster for your own support is the fact that if you go you will make things worse, you have lost all legitimacy. Given his threats at Israel, I think the Assad regime is fair game. Israel should try taking them out so as to make sure that they do not execute their threats. I wonder how the assad clan feels of being propped up by Israelis and the West (as in their fear of the unknown). Guess who the ‘traitors’ are now. Arab nationalism and ‘resistance’ is officially dead. Can’t find any in the Middle East thats for sure. I also wonder how the syrians feel of being abandoned by the the world? no syrian opposition is going to trust any contry’s remarks about democracy now. really, EU arms embargo? take a look at their guns and tanks, do those look like they’re made in Europe? If the opposition does not unite and does not come out with constructive ideas that would influence the silent Syrians and pressure the government, I guess the blood would have been spilled for nothing. Wasn’t the “constructive idea” free elections? Maybe I missed something. Given his threats at Israel, I think the Assad regime is fair game. Israel isn’t going to do a thing, unless some missiles start flying over the border. Seeing what is happening in Egypt, after the fall of Mobarak and his regime, will certainly convince even more of the minorities (Christian, alawis, Shia, Druze ) and the sunnis moderate that a total “revolution” is not a solution for Syria. It seems to open a box of worms. Free elections is only the last and easy part of the “constructive” ideas. There should be first a vision of how the political system will be build, whether minorities are recognized as such or not, different level of the government, senat? parlement, decentralization? Crucial will be the issue of the protection of the religious minorities (around 40% of the population) from extremists islamists? We are seeing the sudden appearance of violent extremists in Egypt. How to prevent that? through tough anti-discrimination laws, crackdowns or else? Thus, I don’t see how free elections would solve anything. Do you have more information about the imminent ‘desintegration’ of the syrian arm forces as reported so diligently by Mr Olmert or is it just wishful thinking? It is interesting that now that the opposition demonstrations have been stopped there is a flurry of Cassandra type of ‘bad news for the regime’: That the ‘coalition’ of countries supporting Bashar is unnatural and will not last, that Turkey will dump Bashar, that the army is collapsing etc…. I agree.. elections at this stage are useless and counterproductive. Democracy is not just elections! I wonder how the assad clan feels of being propped up by Israelis and the West, asks ‘REALLY?’ and I wonder at the exceptional question. Forgetting the other actors who act to prop up the present leader, of course, but showing an interesting and provocative perspective. I wonder if taking a long view of the last major worldwide conflicts can help me understand where Syria will be going in the next twenty-five years . . . The six hundred year slumber under Ottoman Turk rule, an interregnum of change under Mandate from the League of Nations. A nation is born in revolution and the British Empire and La Republique are forced from lawful control of the ancient dominions. Nazi Europe is crushed (though Iberian remnants remain and Marxist rule divides the Old World. Peace on Earth (for the Europeans) and a new order. But the formal peace between Nazi Germany, its allies and its enemies, extended no further than the armistice line of 1918. Notice no wars between the signatories, but great wars between those outside. No peace for Belgium in Africa, no peace for Britain and France and Portugal . . . no peace treaty in the lands of Greater Syria, nor in Transjordan or Palestine or Egypt or Iran or Algeria or Tunisia or Lybya or India or Pakistan or Indonesia or Malaysia or Vietnam or Korea or Iraq. The formal peace between the authoritarian past and the new order came late. Syrians know that the effects of the last world war have not settled in her lands. Syrians must know that all the wars in which she has involved herself must end before she can have peace with her neighbours and within herself. Watch Tunisia as it manages the peace that finally came to its land — the end of the twentieth century wars. Watch Egypt, which will never again raise its armed force against its people or neighbours again, watch Egypt as it builds its peace, its treaty with itself, its new Arab order. Watch Iraq as it totters into the twenty-first century and throws off its shackles. Watch Libya as it comes to peace and builds itself up again. Look long, you Syrians, look close and look far, and see the peace, order and good government that you long for and that no one but you can build. Show Palestine and show Lebanon the way to a new order. Show Iran and the hereditary autocracies how it is done. Show the fearful state occupying the Holy Land what peace can be. Struggle for peace now or struggle later.